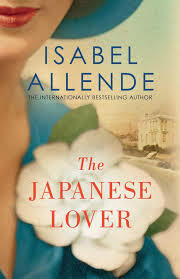 The Japanese Lover, Allende does it again! I have been a lifelong fan of Isabel Allende. I simply get lost in her magical style of storytelling. So when I heard she had a new one, I quickly got on the library waiting list. And no, I was not disappointed. The Japanese Lover is a tale of fierce, forbidden love over many decades, but it also engulfs the reader in how it feels to be in your 80s, having lived life to its fullest. But what is so amazing is how Ms. Allende brings in the lives of many other complex characters and makes you feel you know them intimately. Her mastery of language astounds me at times. With very few words she can tell you so much. This early training did not stand Alma in good stead when she arrived in the U.S. as an orphan, with no ability to ask for help or any other important relationship skills. Allende’s story covers parts of World War II, life in the Japanese Internment Camps and even the story of a Moldovan immigrant. But most importantly this is a story of how we view aging and manage the end of our lives. That is the reason why I bought my own copy. I can see myself rereading this book in fifteen or twenty years, to learn even more of the skills needed to end a life well-lived. ← Our Sunrise This Morning! I’ve been wondering whether to get this book and now I will! Thanks, Laura! Yes Corinne, it’s a winner in my book!